Following on the launch of the GO e-UV System several months ago, Graphics One has brought the manufacturing of this product back to the US following a trend of "reshoring" products which used to be made offshore. The GO e-UV system was originally manufactured offshore and is now manufactured in a high tech facility in the midwestern part of the US. The new US made LampBar system includes the lamp assembly, dual power supply and lamp itself. 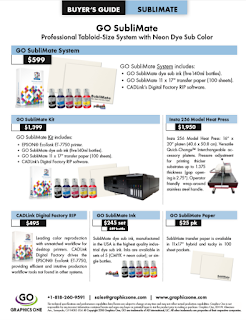 This new system is shipping immediately with a list price of $4,995 and is available exclusively through the GO Distribution Channel.